Sam The Clams Chances are you've driven by and noticed the bubbles in our windows. You may have even seen the Blues Brothers dancing out front. We're Southington's place for fun and great seafood. Our Guarantee You always get the highest quality seafood. From lobsters to clambakes to clam chowder. Take a look at our menu which also includes chicken and hamburgers. We offer t-shirts, golf shirts, hats, and other wear. We also offer great beach products from our partners.We consider some of these items to be unique to our townand invite you to try them or take them home for guests. We also stock a variety of affordable merchandise such as coffee mugs, aloha note pads, and more. Sam the Clam's serves fresh seafood plus other popular items such as burgers and chicken wings. We hope you'll dine in, but you're welcome to do takeout orders. We even have a separate building for takeout. The menu has something for everyone. Our Guarantee You always get the highest quality seafood. From lobsters to clambakes to clam chowder. Take a look at our menu, which also includes chicken and hamburgers. Meet your friends in our pub and sip on an array of delicious beers and mixed drinks. Our bartenders always serve with a smile. Our "underwater atmosphere" surrounds every customer. Bubbles rise constantly in the side windows and can be seen both inside and out. 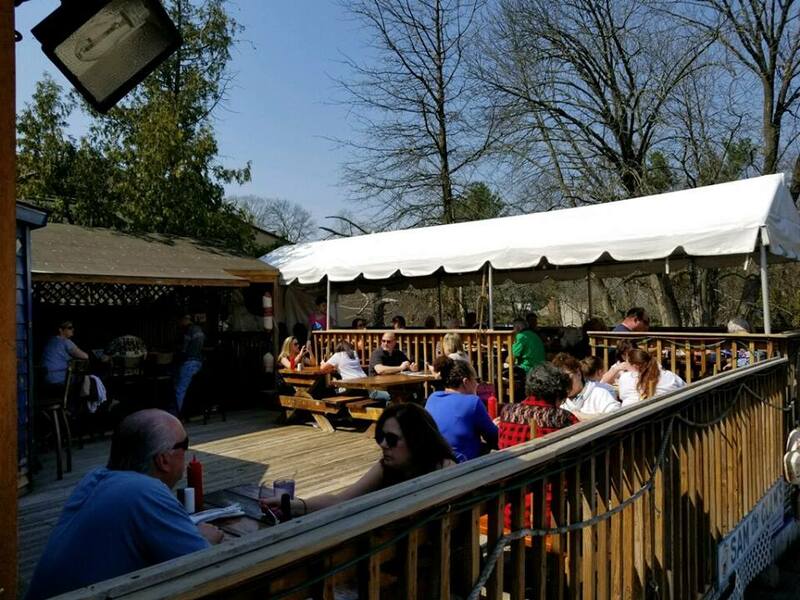 Plus, in seasonable weather, you can party or dine on a partially covered deck. We also have plenty of safe parking. When you're in the mood for "a drink or two" and want an atmosphere unlike any other bar in town, stop in at Sam the Clam's. There's a bar with comfortable seats where you can watch a game or the news on TV. If you prefer, sit at a booth with your guests and enjoy the porthole on the wall. Service is also available on an outdoor deck (seasonal). We also have a groovy gift shop across the street from the pub. We stock shirts, beach items, postcards, note cards, and gift items such as mugs and small clocks. Gift cards are available for use in the restaurant or store. Eating, drinking and shopping at Sam the Clam's is the perfect way for anyone to enjoy a staycation. We hope you'll become a regular, too. If you live far away, we're glad you discovered our website and hope you'll stop in whenever you visit Connecticut. Check out the pub! Check out the grub! 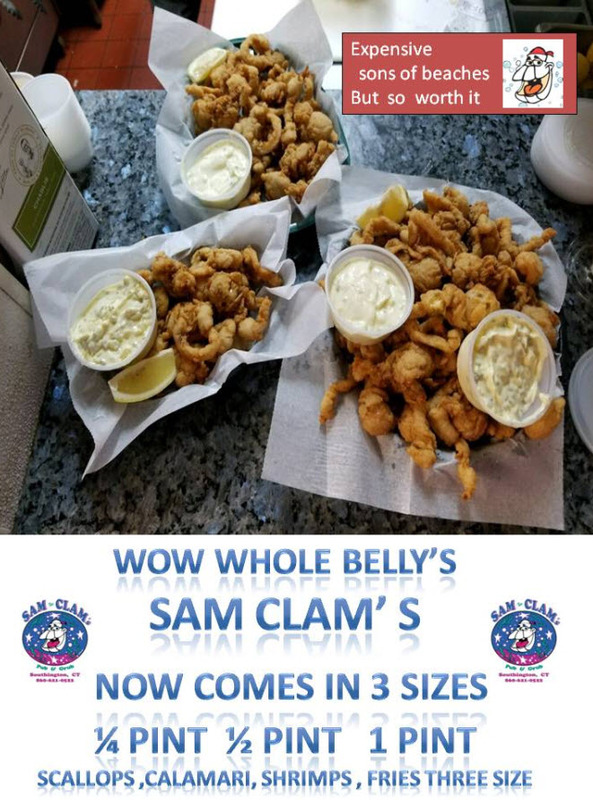 If you're looking for a restaurant gift certificate, treat yourself or someone else to the taste of the famous seafood with Sam the Clam's Store and Restaurant Gift Cards. They're a great way to celebrate special times, or just a way to make any day a bit more extraordinary. To make the purchase of your restaurant gift certificates convenient for you, our gift cards are available in three amounts: $10, $25, and $50. They can be used for purchases in the restaurant or the retail store. Monday - Thursday 10:00a.m. to 1:00 a.m.
Friday & Saturday 10:00a.m. to 2:00 a.m.
Sunday 10:00a.m. to 1:00 a.m.